From the vantage point of a ship at sea, the surface of the ocean represents a daunting challenge. The sea surface seems so huge from that perspective that owe wonder how we can ever hope to understand what goes on beneath it. On a global scale the surface of the ocean covers about 360 million square kilometers (nearly 140 million square miles). And that’s just the top of it! The average depth of the oceans is about 4,000 meters (nearly two and a half miles). Altogether, the interior of the ocean is by far the largest living space on our planet. Within this vast habitat are the largest ecosystems and the largest animal communities on Earth – largest in terms of volume, or numbers of individuals, or biomass. This immense realm is the least explored of all the Earth’s major habitats and its resident fauna is, to a great extent, still unknown. What kinds of animals live there? How are these species distributed within the habitat? How are they organized into ecological groups? What are their natural patterns of variability? In a previous Keynote presentation, Edith Widder gave us an outline of the principal depth zones of the open ocean, based chiefly on light penetration. Near the surface is the epipelagic, where there is sufficient light for plants to thrive, the waters are well mixed and temperatures are relatively warm. From about 200 m down to 1,000 m is the mesopelagic, where light levels and temperature decline rapidly and there is little vertical mixing. Below 1,000 m is the bathypelagic, where conditions are cold, dark, and the weight of the water above creates great pressure. Figure 1. A profile of the oceanic water column, showing some of its characteristic features, including diel (day/night) vertical migrations (DVM). Modified after Herring, 2002. In the sunlit upper layer of the ocean the tiny plants of the phytoplankton convert solar energy into organic compounds through the process of photosynthesis. This is the primary source of nutrients that flow through the oceanic food web. First in line to feed on this productivity are animals called grazers, and most abundant among them are two types of small crustaceans: copepods and euphausiids. Copepods have teardrop-shaped bodies with five pairs of legs, one centrally located eye, and a pair of large, sensitive antennae. They feed by combing phytoplankton cells and other particles out of the water using bristly appendages located near their mouths. Euphausiids, also known as krill, have bodies like shrimp and feed on phytoplankton and organic particles by sieving water through a basket of bristles around their mouths. Figure 2. Krill swarm of Euphausia in Monterey Bay; video frame grab from the remotely operated vehicle (ROV) Ventana. Copyright MBARI. Because their food source is located near the surface, crustacean grazers do almost all of their feeding in the ocean’s upper layers. Most of them feed only at night, when the sea surface is dark. As the sky begins to grow lighter just before dawn, they swim downward until they reach depths around 300 m, where very little sunlight can penetrate. They spend the day in darkness then return to the feeding grounds only as the sun sinks below the horizon. The advantage of this vertical migration strategy is that by remaining always in darkness, they reduce their chances of being eaten by predators who hunt by sight – a group that is abundant in epipelagic waters. 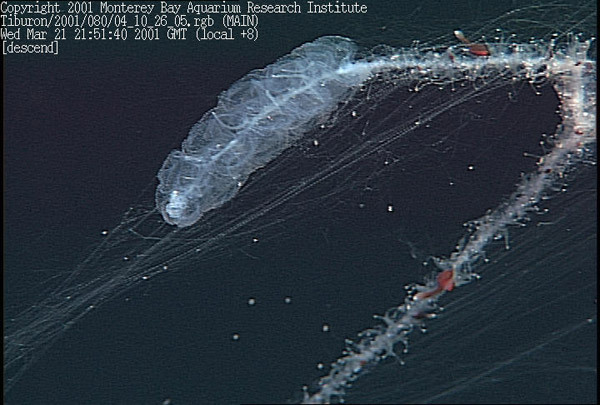 Salps and doliolids are transparent, gelatinous animals that also feed on organic particles. These grazers have cylindrical bodies with muscular walls and internal filters. As they flex their muscles, water and particles are pumped through their bodies. The particles stick to the filters and are retained for food while the water passes out the rear and provides propulsion. Some species occur in long chains created by reproductive budding; the chains of Cyclosalpa form spirals. Another group of particle feeders uses external filters to separate food from the surrounding water. These animals, called larvaceans (or appendicularians), create complex, highly structured filters made of mucus. Because the larvaceans are attached to and live within these structures, we call them “houses”. The shape and configuration of larvacean houses is characteristic for each species and some of them can become quite large, with a maximum dimension of more than a meter. As time passes, the filters become clogged with particles that are too large to pass through the mesh, and the feeding efficiency of the system drops. At this point the larvacean simply breaks free of the old house, swims away and builds a new one. Animals at the next step in the midwater food web feed on grazers and filter-feeders and thus are carnivores. Among the most abundant of these predators are several kinds of fishes. Lanternfish are so named because of the many bioluminescent organs along their sides and bellies. As Edith Widder explained in her earlier Keynote, the fish use these light organs to recognize each other in the dark, and to erase their shadows so that predators cannot see their silhouettes against the lighted waters above. Nearly all lanternfish are vertical migrators, who spend the daylight hours in darkness at depths between 300 and 600 m. Like much of the prey they eat, at sunset they begin moving into shallower layers for a night of feeding. Figure 4. Diagram of the vertical distribution patterns of mesopelagic and bathypelagic fishes in a typical midwater community. 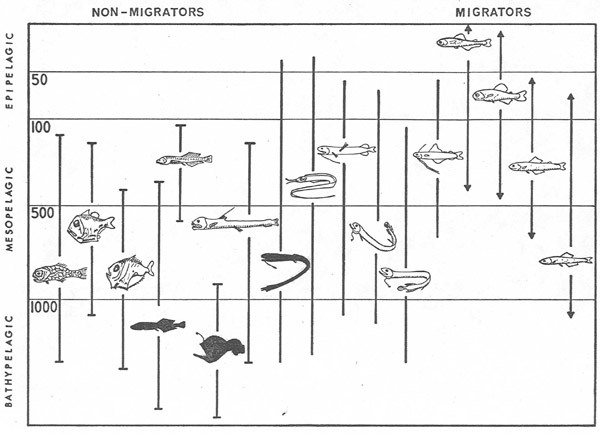 Modified after Robison, 1976; Natural History 85(7). The question of why these fish migrate vertically is one that puzzled scientists for a long time. Is it because they are avoiding visually cued predators of their own? Or are they simply following their migratory prey? The answer came from studies in Antarctica, where conditions allow a comparison of the relative importance of several factors. Antarctic krill, the chief food of the lanternfish there, do not migrate. Instead they rely on schooling to avoid the abundant visually-cued predators that occur near the surface. That the Antarctic lanternfish keep migrating, even when it takes them away from their preferred prey, is strong evidence that predator avoidance is the driving force behind their own vertical migrations. Competing with lanternfish for the crustacean grazers is a wide variety of gelatinous predators. In many locations the dominant forms are colonial animals called siphonophores. To appreciate siphonophores, it sometimes helps to think of ant or bee colonies, where distinct individuals with different body types and different roles in the colony work together for mutual benefit. The same is true for siphonophores, with the difference that the specialized individuals are physically connected to each other along a stem-like tube through which they share food. Figure 5. Apolemia, a giant siphonophore that reaches lengths up to 15 meters. The cluster of swimming bells is trailed by a long series of tentacle-bearing feeding units. Video frame grab from the ROV Tiburon. Copyright MBARI. Subsequent steps in the midwater food web include a wide range of carnivores that prey on animals at lower levels of the web, as well as on each other. Within this group are squids and fishes that range widely through the mesopelagic zone, apparently unaffected by the day/night cycle that triggers vertical migrations. These predators rely on speed, stealth and trickery to catch their prey. 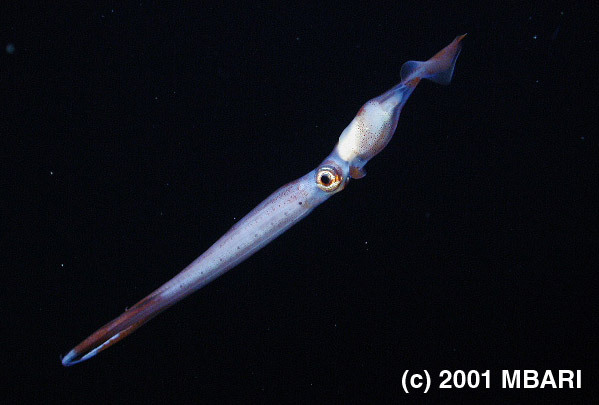 Chiroteuthis is a slender, largely transparent squid that “fishes” for its prey much as human fishers do. Two of its eight arms are particularly thick and strong, with open grooves running down the center. The squid’s two long feeding tentacles slide out through the grooves and over the ends of the supporting arms to hang down far below. Along the side of each tentacle is a series of light organs. With its body positioned horizontally, Chiroteuthis dangles the feeding tentacles, moving them up and down while flashing the lights in sequential waves up toward the other arms. This behavior attracts fish and other prey close enough to be captured by the tentacles and then drawn up and into the squid’s sharp beak. Figure 6. 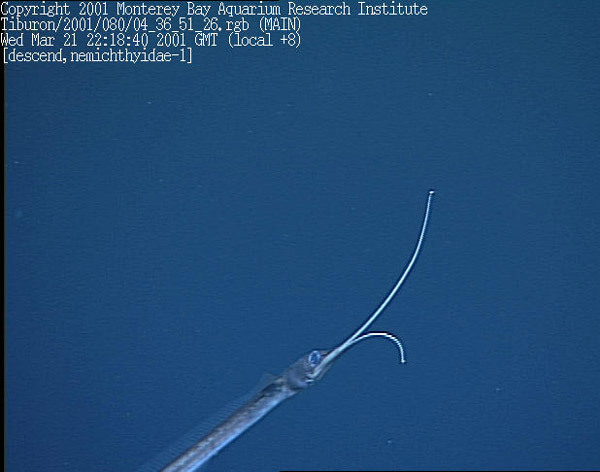 Chiroteuthis, a cranchiid squid; digital image from the ROV Tiburon. Copyright MBARI. Dragonfish, like Idiacanthus, feed on the same prey as Chiroteuthis and use similar techniques to attract and capture their meals. These fish have long, black bodies and large mouths filled with long, sharp teeth. The teeth are hinged to fold backward toward the gullet but not forward, so anything that enters the mouth doesn’t come back out. Hanging beneath the chin of the fish is a filament called a barbel, with light organs and sensory tendrils at its end. Dragonfish lie in ambush, using the light in the barbel to attract prey. When a fish or crustacean approaches close enough to be detected by the sensory fibers, the predator lunges forward to snap up its meal. The heads of snipe eels (Nemichthys, Borodulina) have curious, bird-like beaks with tips that curve gracefully away from each other. The beaks are covered with tiny, hooked teeth that function like half of a velcro strip. The eels use their long, sinuous bodies to sweep their beaks through the water trying to entangle the antennae of sergestid shrimps (Sergestes), which are apparently their only source of food. The surface of the shrimp antenna is like the other half of velcro and as soon as the two come in contact the beak locks on the antenna and the shrimp is trapped. This kind of specialization is an evolutionary gamble for the eels, because their unusual beaks make them poorly suited to capture anything else to eat. But the gamble has paid off and so long as the abundant shrimps are present, the snipe eels will continue to succeed. One of the most rapidly developing areas of midwater research concerns that portion of the food web dominated by gelatinous animals. Salps, doliolids and larvaceans are part of this sub-web and they occupy ecological roles as primary consumers. Siphonophores are important predators along with medusae, ctenophores, chaetognaths and other gelatinous forms. Some of these predators specialize on crustaceans while others feed only on other jellies. Still others have very broad means of collecting prey and will eat anything they can catch. The result is that a great deal of the upper ocean’s productivity winds up sequestered in the bodies of gelatinous predators, many of whom only eat each other. Because we do not yet know how the food web is structured after the jellies (that is, we don’t really know much about other animals that eat them) we cannot yet determine how or how much nutrient energy is cycled back into the mainstream of the pelagic food web. We do know that because of their low organic content, jellies can reproduce and grow quickly in response to fluctuating food supplies. Likewise, they are able to repair themselves and even re-grow new body parts when they become damaged. Much remains to be learned about these important and fascinating animals. Ctenophores have a broad range of body shapes and feeding strategies. Some have sticky tentacles to feed with while others surround their prey with fleshy lobes and still others simply swim up to and engulf their prey. 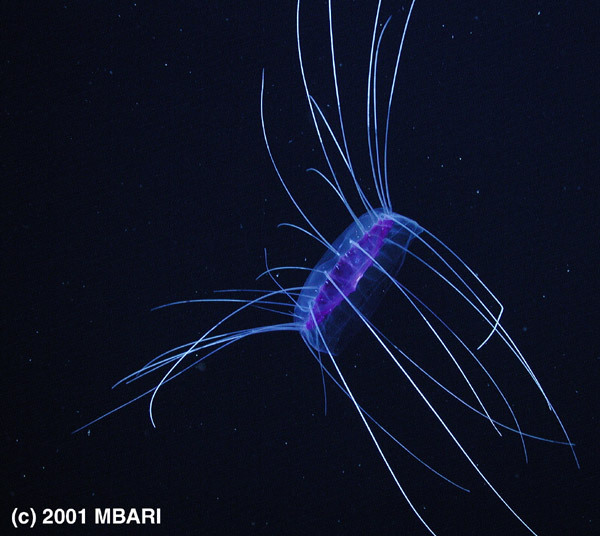 All of them share a common means of propulsion, the ctene rows of fused cilia that give them their common name — comb jellies. Beroe is a common ctenophore that specializes in feeding on other jellies. Their bodies, shaped much like the sole of your shoe, range in size from 5 to about 15 cm. Beroe’s mouth spreads widely across the front of its body and operates like a keyless zipper. With no eyes and a poorly understood sensory capability, we don’t yet know how they find their prey, but it doesn’t seem likely that they just cruise around until they bump into something good to eat. However they find it, Beroe eats small prey by swallowing it whole, but it also has hard, stubby teeth that let it bite chunks out of larger jellies. Figure 8. 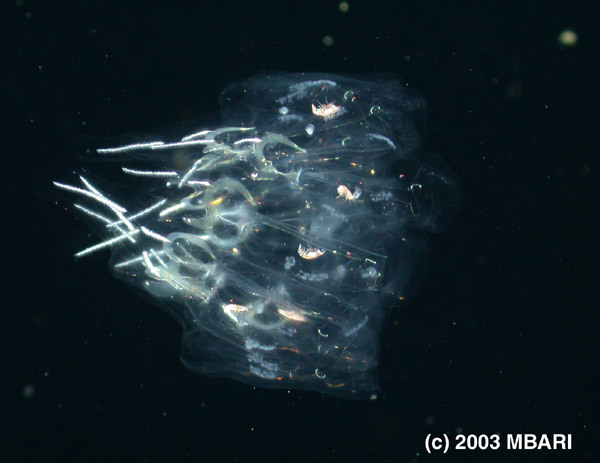 Beroe, a mesopelagic ctenophore (comb jelly). The colored "lights" are not bioluminescence, but iridescence created by the diffraction of light from the ROV. Video frame grab from the ROV Ventana. Copyright MBARI. Medusae are the animals we usually think of when someone mentions jellyfish. 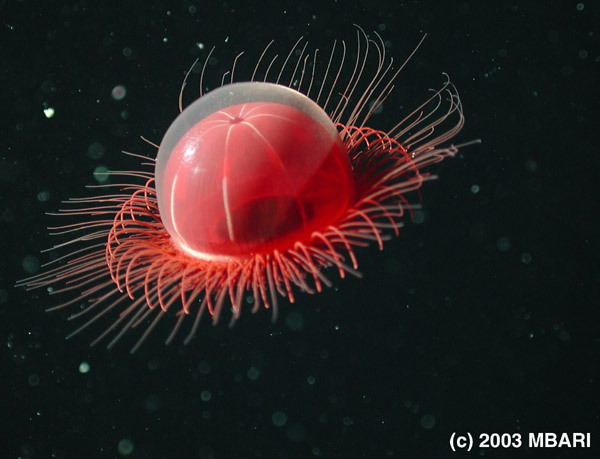 The basic structure of medusae consists of a muscular swimming bell with a mouth and digestive pouch on its underside. Around the margin of the bell are tentacles with stinging cells that can inject toxin or tiny hooks into the flesh of other animals. Radial canals within the swimming bell contain the trunk lines of the nervous system and also the gonads. Medusae are generally indiscriminate predators that eat whatever is caught by their tentacles although the type of stinging cell they employ gives them a degree of selectivity. Solmissus is a relatively large medusa that reaches about 12 cm in diameter. Unlike some medusae that wait in ambush, Solmissus is an active hunter. As it moves through the water it holds its tentacles forward or out to the sides to increase its chances of contacting salps and other gelatinous prey. Figure 9. 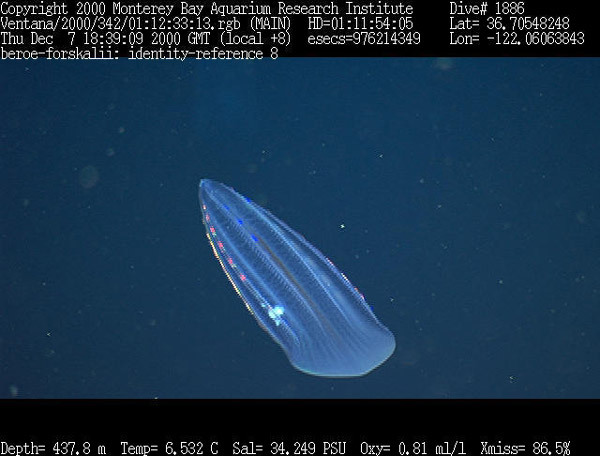 Solmissus, a mesopelagic narcomedusa. This animal is swimming upward and to the left. Digital image from the ROV Tiburon. Copyright MBARI. Figure 10. Benthocodon, a deep water medusa that inhabits the water column as well as the deep seafloor. Digital image from the ROV Tiburon. Copyright MBARI. Below about 1,000 m the character of the midwater habitat changes and so do the inhabitants. At about this depth the last of the photons of light from the sun disappear and the water is profoundly dark except for flashes of bioluminescence. Likewise, the productive upper layers are too far away for nightly round-trip visits to be efficient, and the residents of these depths rely chiefly on food that sinks or swims down to them from above. 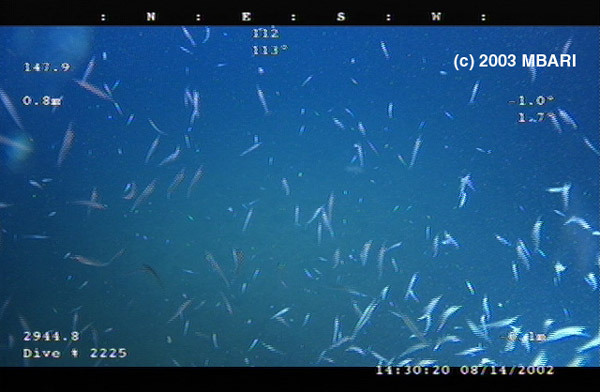 At bathypelagic depths (1,000 m or more) the quantity and quality of available food is considerably diminished. As a consequence the pace of life is slower, metabolic rates are low, and the tissues of the animals are watered-down. With no sunlight at these depths the role of vision becomes far less important and heightened sensitivities to sound, water movements, and chemical cues prevail. These depths are home to a number of strange and wonderful animals whose adaptations for success in this harsh environment sometimes make them seem outlandish. Vampyroteuthis is a living fossil that reflects the evolutionary line of cephalopods before it split into the eight-armed octopuses and the ten-armed squids, about 300 million years ago. 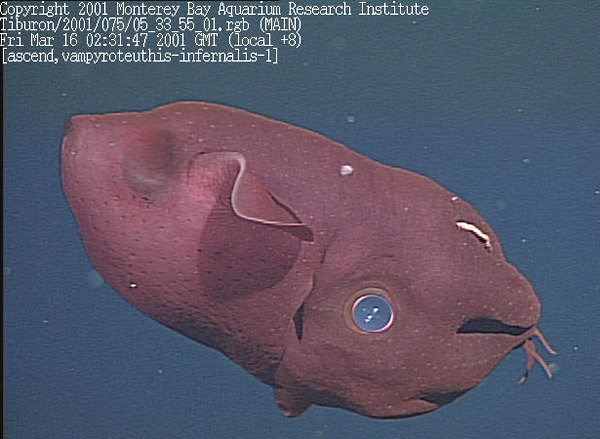 Vampyroteuthis has a soft, dark-brown body with fins near the tip of the mantle and a pair of large light organs near the fins that open and close like the iris on a camera lens. There are eight arms, with webbing between them and small light organs at each arm tip. Each arm has a series of suckers and parallel lines of finger-like cirri, and where the arms meet at the center is a sharp beak. The eyes are very large and reflect light that is a beautiful opalescent blue. Figure 11. Vampyroteuthis, an archaic, deep-living cephalopod. The dark patch to the left of the fin is a closed photophore, the siphon is visible and pointed downward. The white filament on the upper surface is a sensory structure that can be trailed far behind the animal. Video frame grab from the ROV Tiburon. Vampyroteuthis swims by flapping its fins and with jet propulsion created by pushing water out of its mantle through its respiratory siphon. When threatened by a potential predator, it releases hundreds of tiny, glowing particles from its arm tips and creates a cloud of light as it sweeps the arms up and over its body. For more information on Vampyroteuthis and to see the luminous cloud, visit the website at http://www.mbari.org/midwater/vamp. Bathypelagic fishes like gulper eels and anglerfish share some traits that give us clues to what the conditions of life must be like at great depths. The eyes of these fishes are often very small and probably do not serve to record images. Most likely they function just to indicate the presence of bioluminescence, with little more information than “the lights are on.” Another common characteristic is the presence of a huge mouth connected to a distensible stomach. This allows the fishes to engulf very large food items, and this indicates that meals are probably few and far between, so that every opportunity to feed must be seized. Physiologists have reckoned that a single big meal may keep an anglerfish supplied with nutrition for the better part of a year. Figure 12. 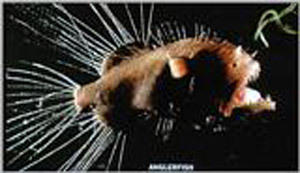 Bathypelagic fishes: Caulophryne, a deep-sea anglerfish with small eyes but well-developed sensory filaments, Copyright B.H. Robison. Figure 13. 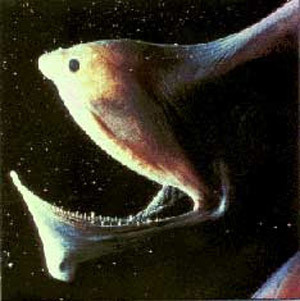 Bathypelagic fishes: Saccopharynx, a gulper eel with a cavernous mouth that lets it eat prey larger than itself. Copyright B.H. Robison. Mating opportunities must also be rare at great depths and some anglerfish have evolved an unusual but effective means to ensure reproductive success. While females may become as large as footballs in some species, their mates aren’t much bigger than the end of your finger. Males are highly specialized with well developed olfactory organs, gonads, and swimming muscles, but not much else. They have a single, simple job to perform and that is to find a female, presumably by following a trail of pheromones, then attach to her by biting into her flesh. Once connected the tissues of the two animals fuse and the male begins to degenerate until there is just a lump of flesh surrounding his gonads. Nourished by the female’s blood the male is most likely cued by chemical signals to release sperm when she releases her eggs. The deeper we explore the more we learn, and the more we realize there is to be learned. As Peter Herring indicated in his Keynote presentation, we have just begun to explore the bathypelagic and deeper regions with modern technology. The discoveries made so far are remarkable, but with less than 2% of the deep sea explored to date we can guarantee that the future will hold many more.